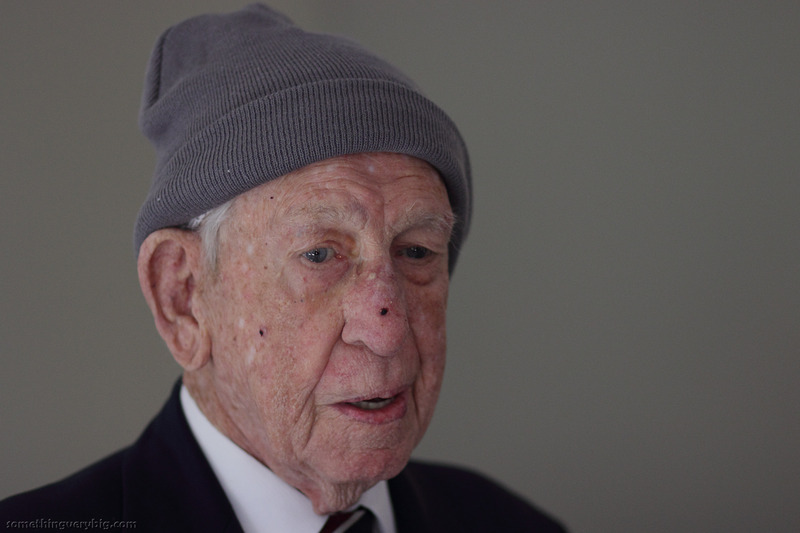 What happens when the last veteran dies? 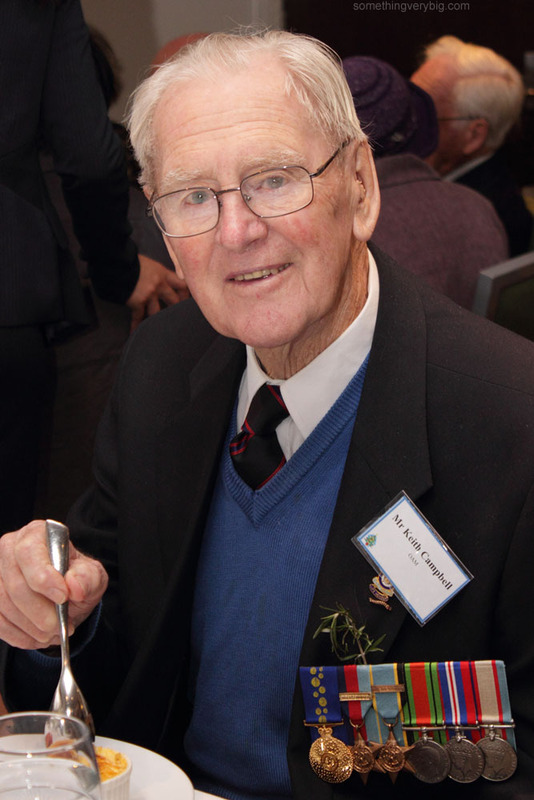 Once again Anzac Day approaches. Once again I will board an aeroplane and fly to Sydney. 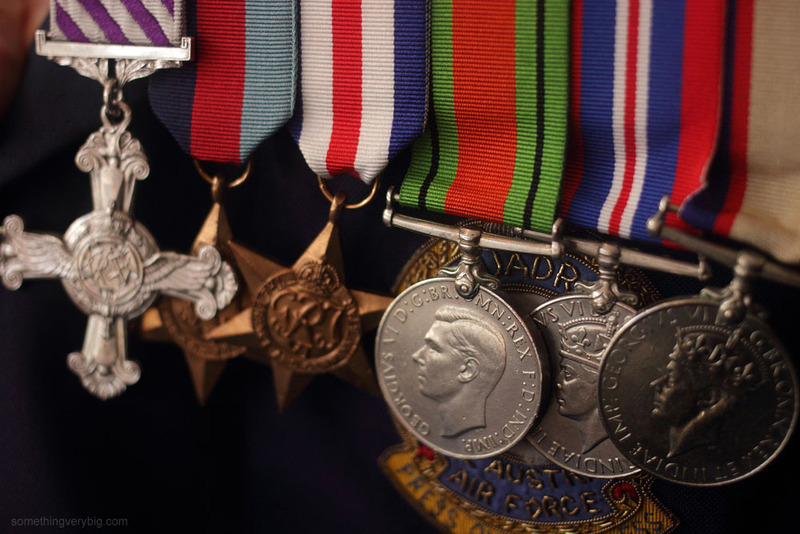 Once again I will pin my great uncle Jack’s medals to the right side of my chest. 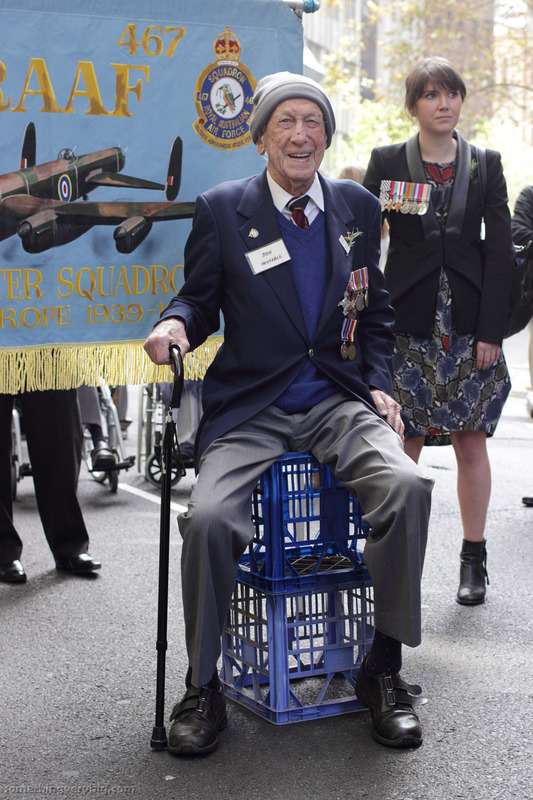 Once again I will hoist the 463-467 Squadron banner high, and once again I will march. 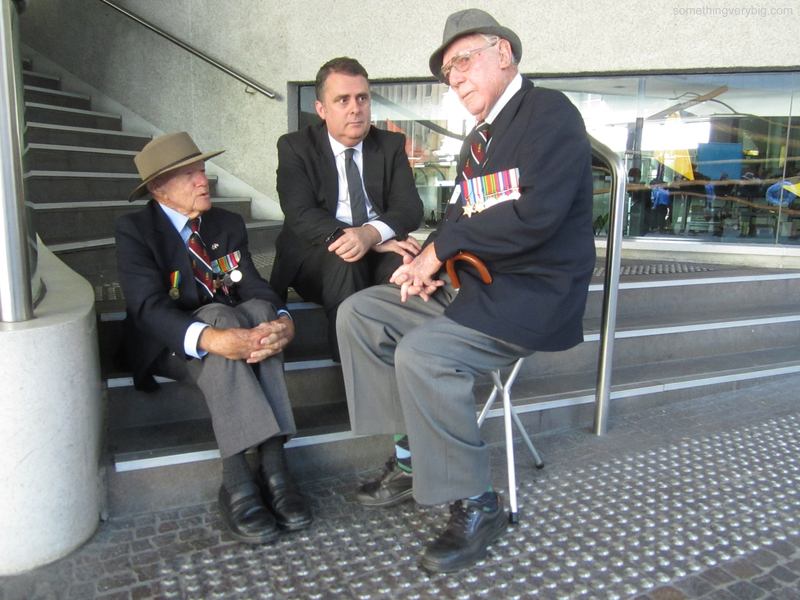 I’ve been struggling to write about the future of the Anzac Day march – or specifically the future of my part in it – for several years now. At around this time each year I’ve grappled with it, starting something but failing to come up with a coherent argument. So I’ve put it off. Chickened out. Relegated it to the ‘too hard’ basket. But sure as eggs, once again here I am. And the question has become more urgent. So this year I’m going to finish it. 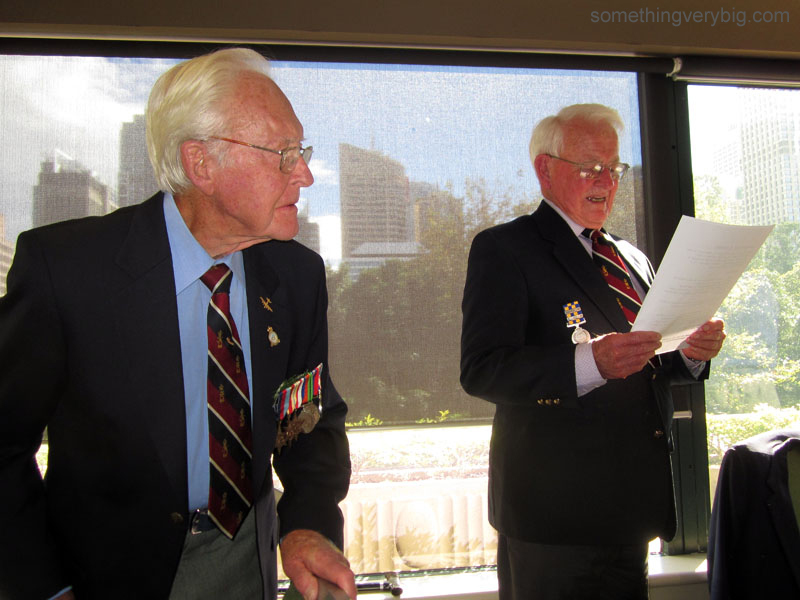 I’ve been involved with the 463-467 Squadrons Association in Sydney for about a decade now. 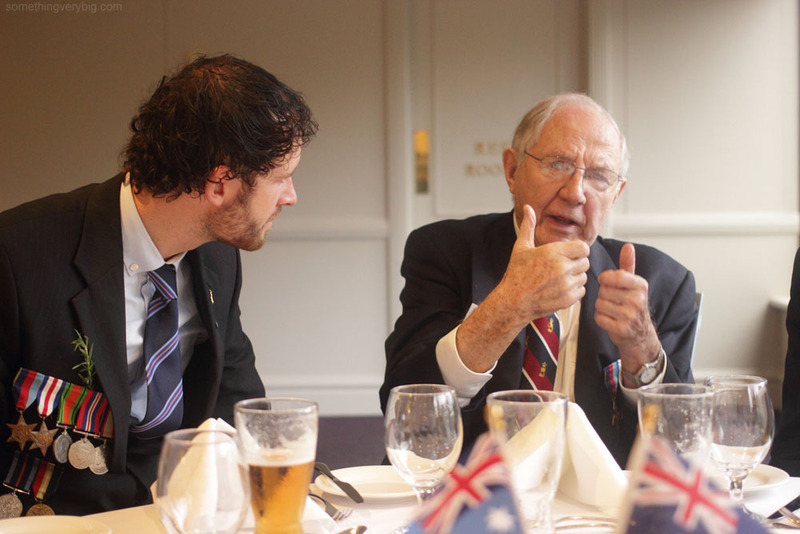 Long enough that I now consider friends many of the veterans, friends and family that make up the group. 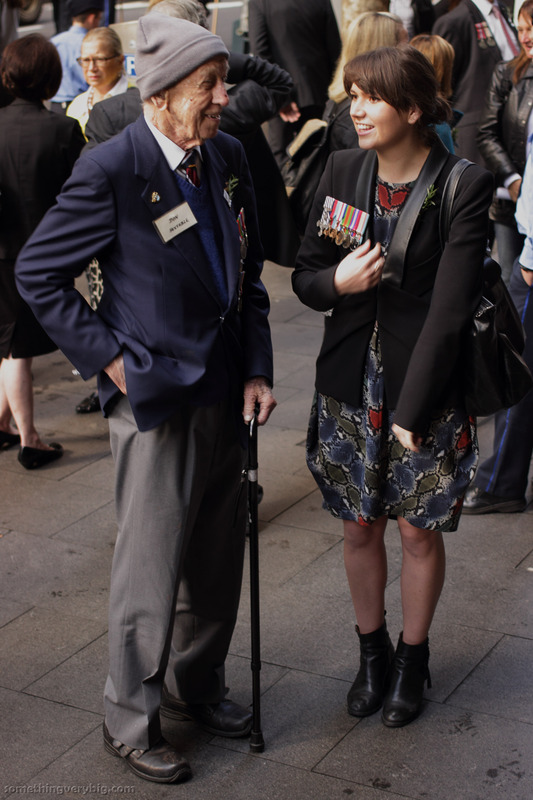 This is why, despite living in Melbourne for the last five or so years, I still prefer to go to Sydney for Anzac Day: it’s one of only a handful of chances I have each year to catch up with them. 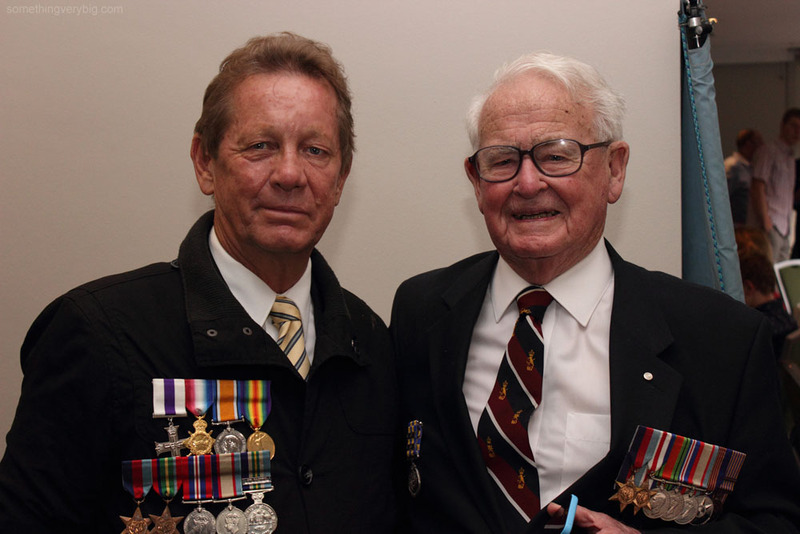 As time has passed, so too has a fair number of veterans I knew. 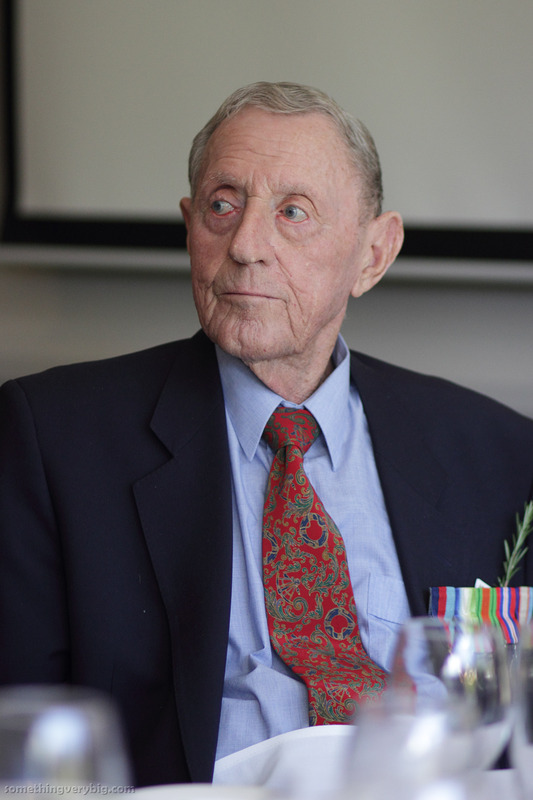 Men like Reg Boys, Rollo Kingsford-Smith and David Walter, among several others, have all gone to the Great Crew-Room in the Sky. In the last year or two however, as those who are left have grown very very old indeed and as age wearied them more and more, the trickle has turned into a flood: George Douglass. 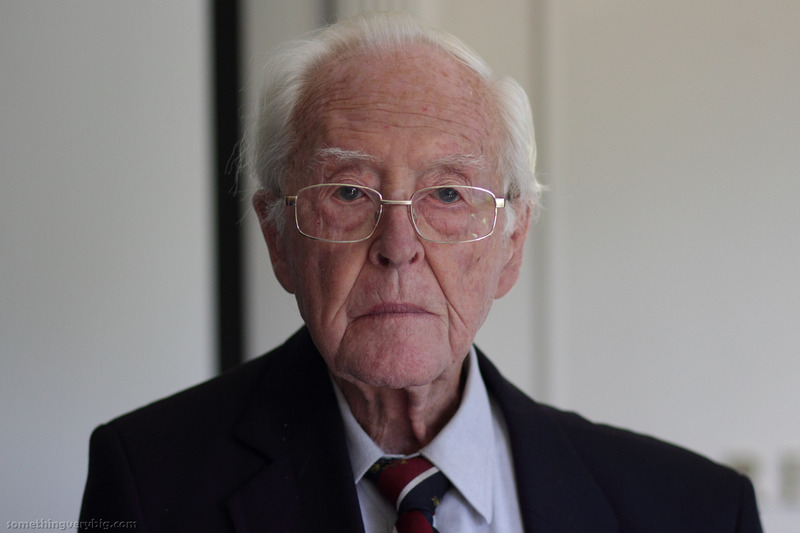 Harry Brown. 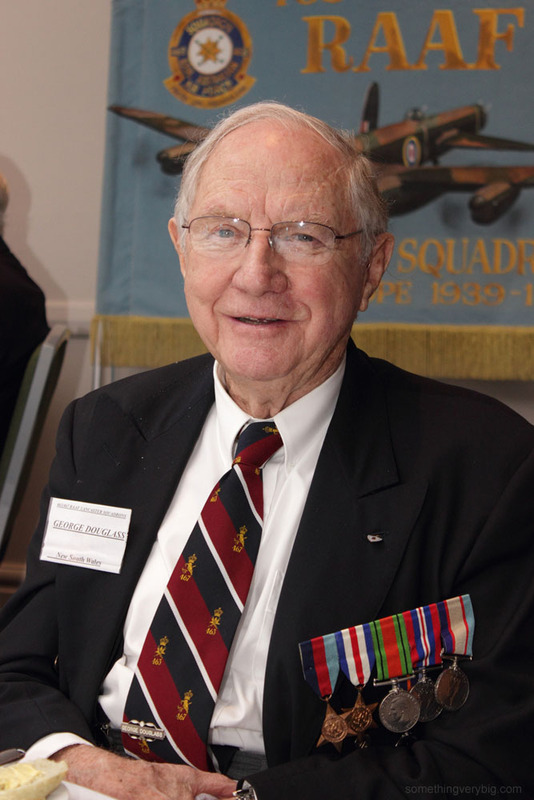 Hugh McLeod. Albert Wallace. And now Don Huxtable. 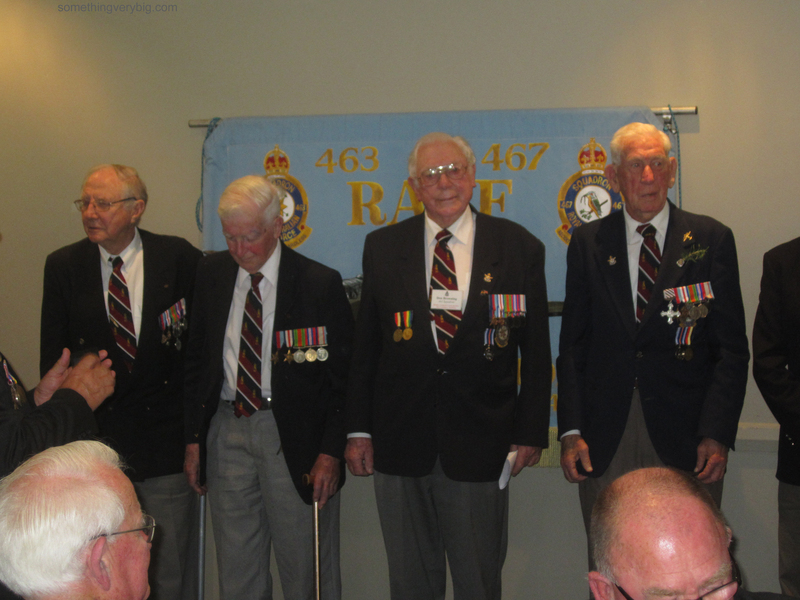 And these are just Sydney-based 463-467 Squadron Association veterans I knew personally. 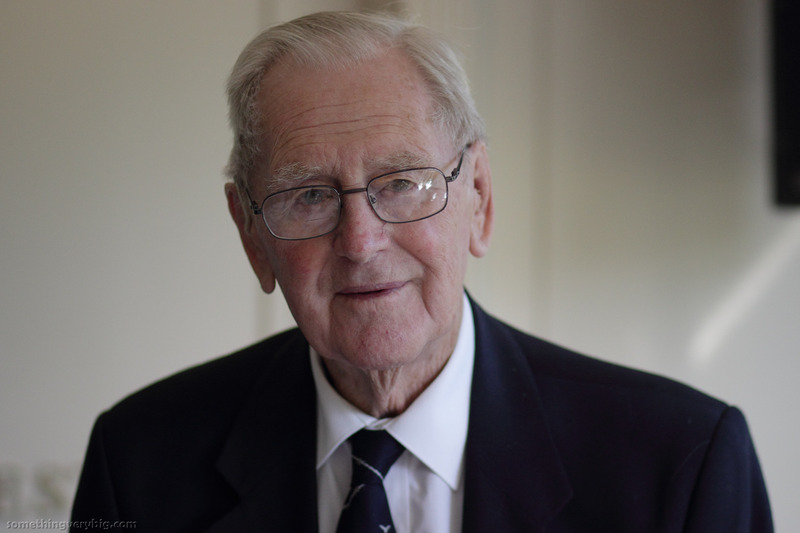 As year follows year, more old men disappear. 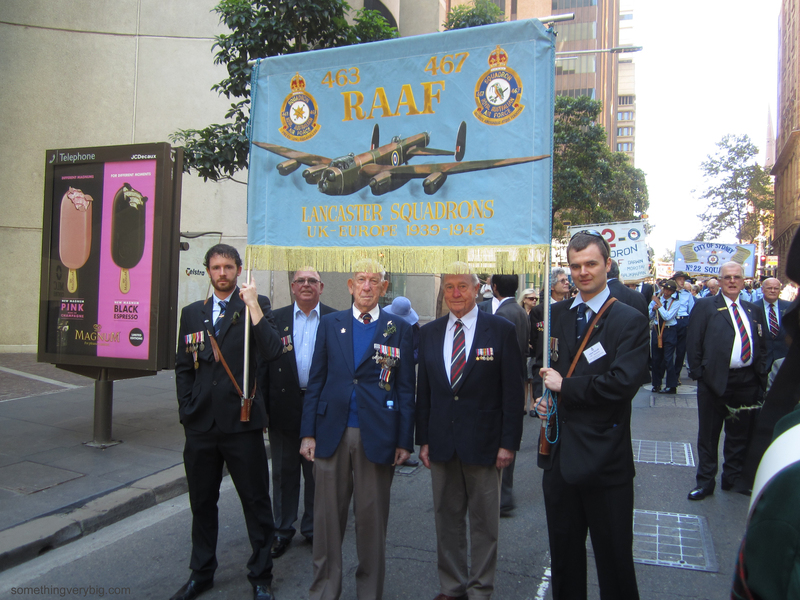 In 2014 just three veterans started the Anzac Day march with the 463-467 Squadron banner. That was the first point at which I began actively wondering about the future of the Squadron banner in the march. 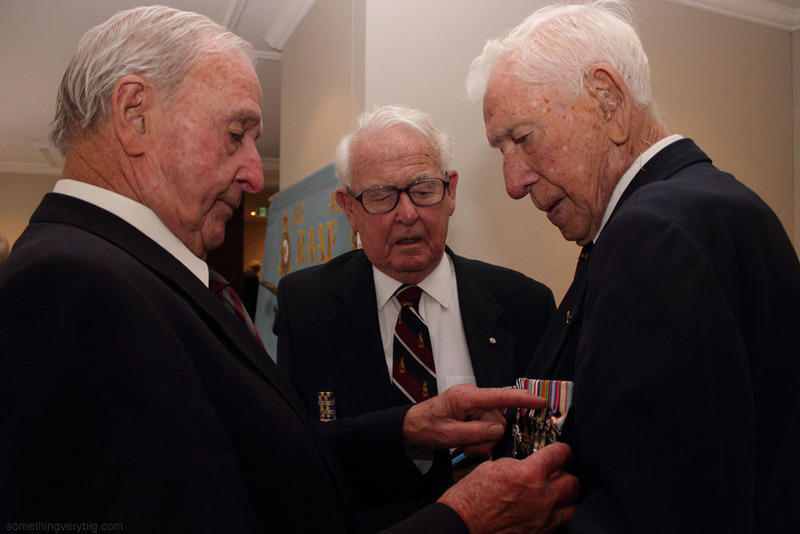 One of the three that year was unable to complete the course – and the other two have since died. Improbably in 2015 numbers actually grew to eight, including two riding in trucks and two in wheelchairs, but given the numbers who have died in the intervening year that is likely to have been an aberration. Don Huxtable’s recent passing has further focused minds on a difficult but inevitable truth. 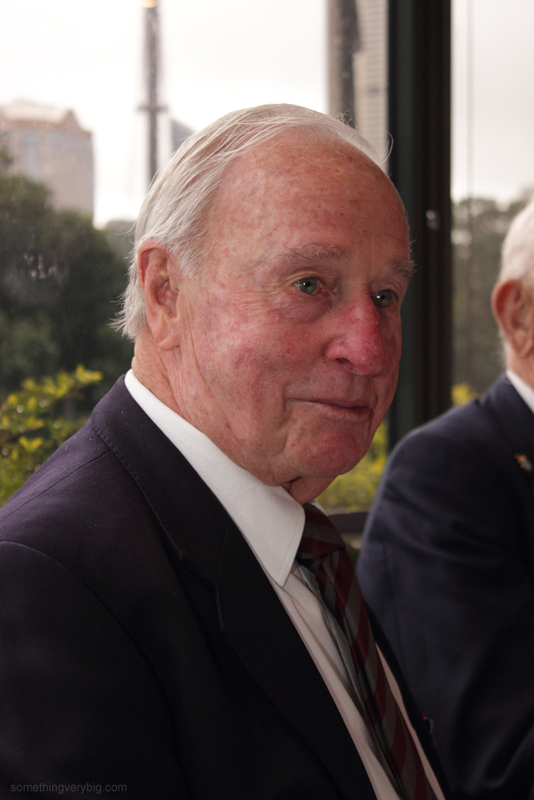 There are now very few 463-467 Squadron veterans left who remain capable of marching behind the banner on Anzac Day. One day, sooner than we all would like, they too will pass. 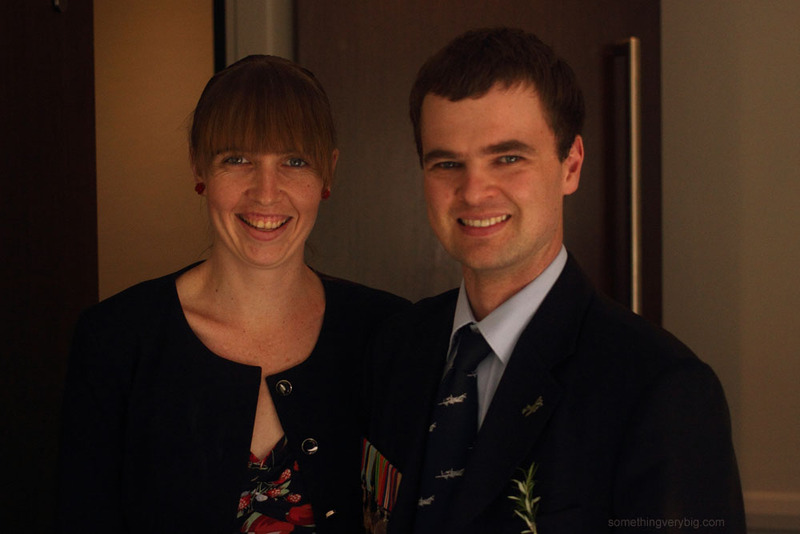 There’s been a fair bit of controversy in recent years about marching on Anzac Day, and specifically how descendants of veterans, such as myself, fit into it. 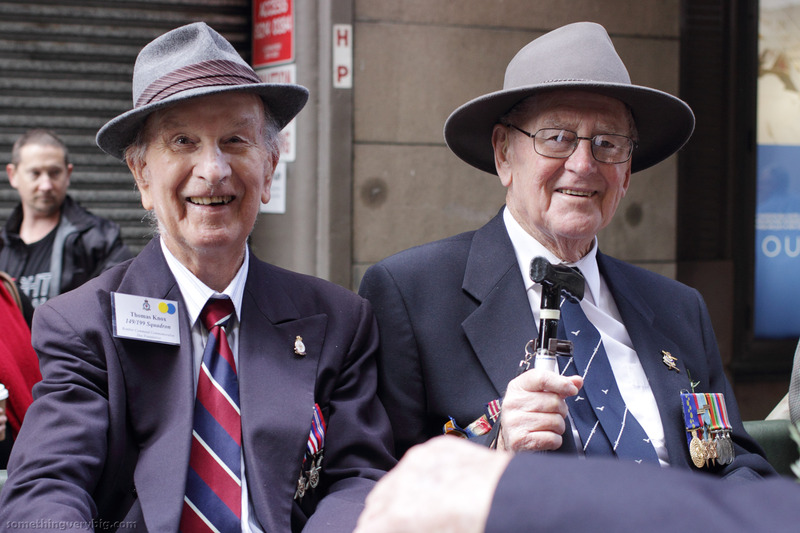 Originally, of course, it was only the veterans themselves who were allowed to march – and that was highly appropriate. 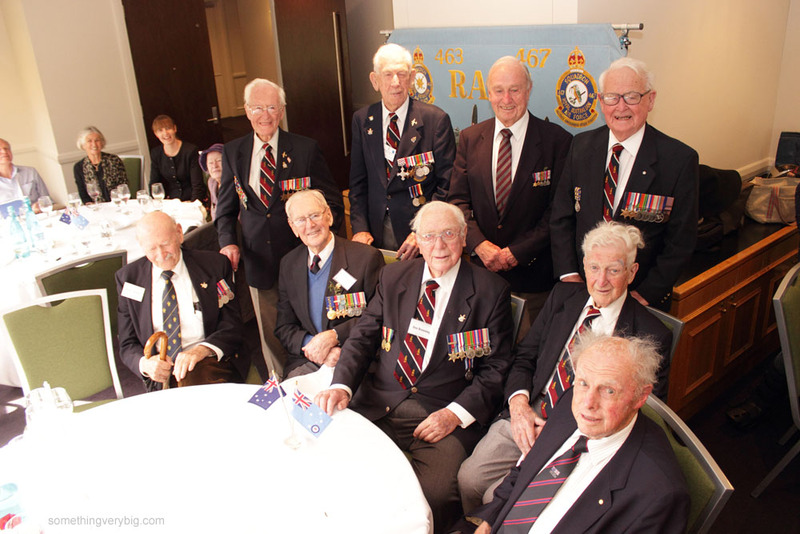 But those were the days when there were a significant proportion of veterans of conflicts like WWI still alive. 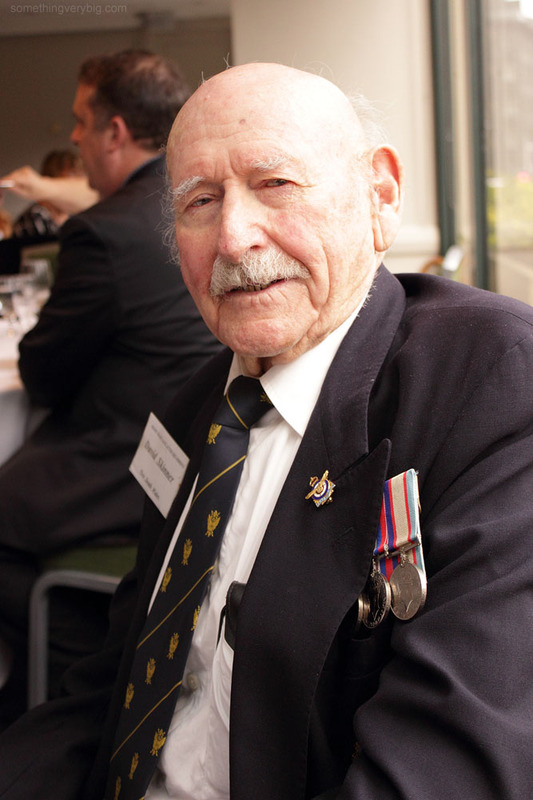 Those first Diggers are long gone now, and descendants have begun marching in their place. 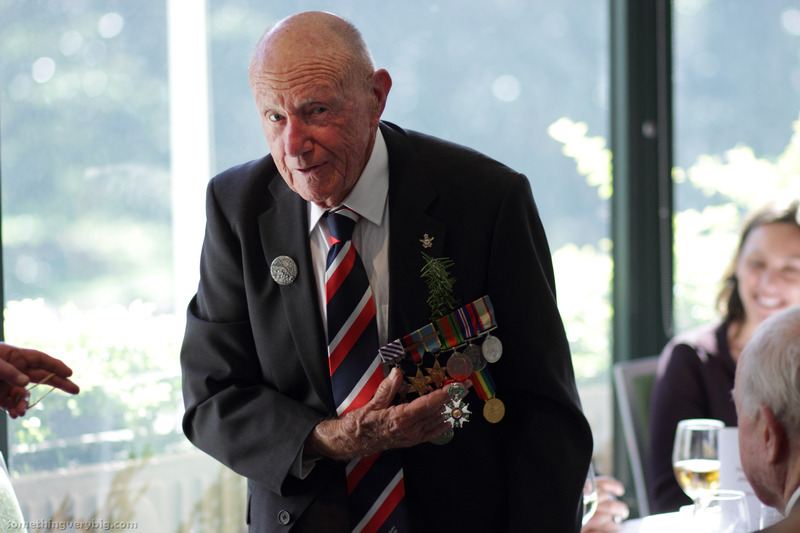 But as the WWII Diggers now slowly fade away, the few who remain sometimes seem in danger of being swamped by the ever-increasing crowds of descendants. In 2008 it all got too much for the RSL in Sydney. 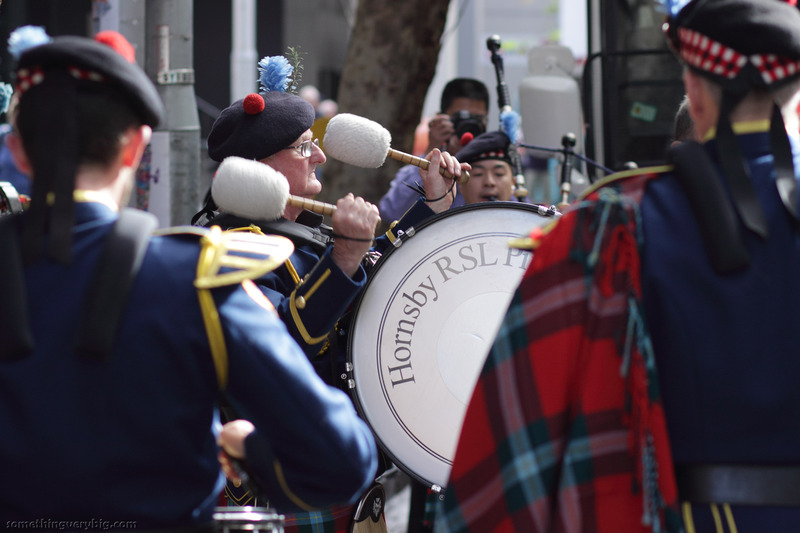 They began politely suggesting that descendants go to the back of the parade instead of marching with their ancestors’ units. 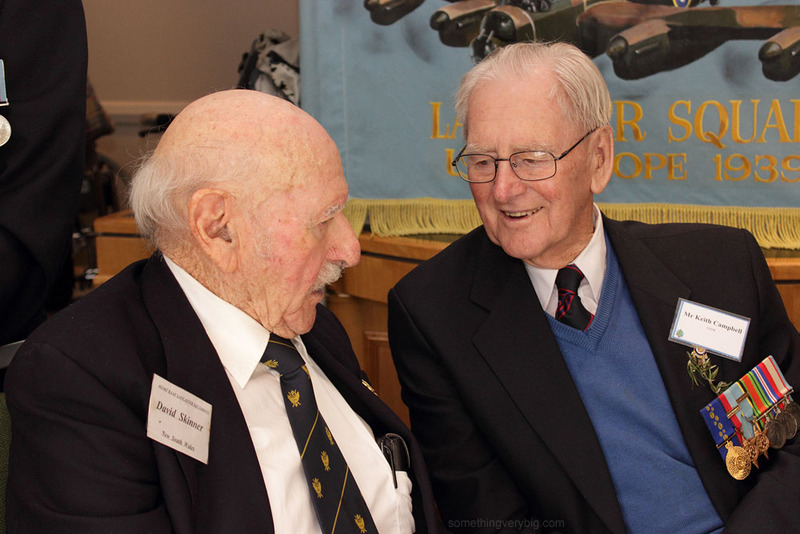 In more recent years that polite suggestion has become more assertive, and changes have been made to the traditional format so that WWII veterans are given more prominence at the front of the march (with a strict limit of one carer each allowed with them). Instead of the WWI banners leading the march, they now bring up the rear. This year it’s spread to Melbourne, with similar adjustments on the cards for the southern capital’s march. 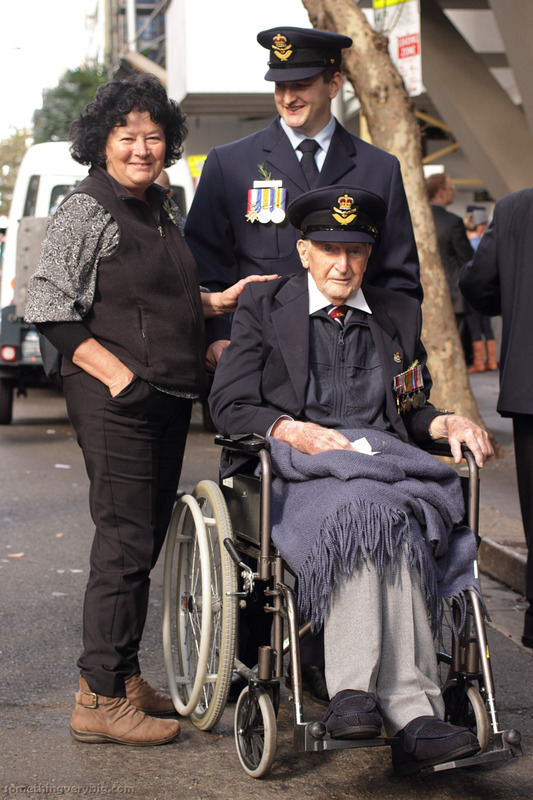 Far be it, of course, for me to criticise the involvement of descendants in the Anzac Day march. I have, after all, been one of them for several years now. 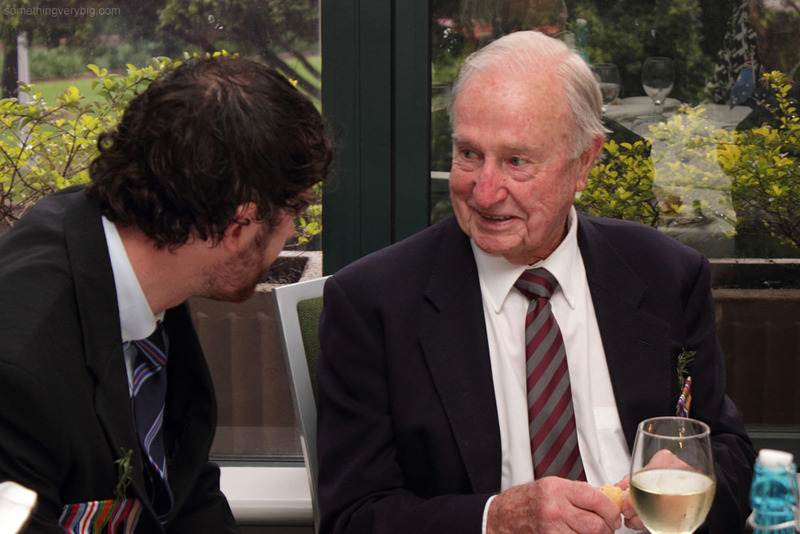 There’s no doubt that it’s been a special experience. 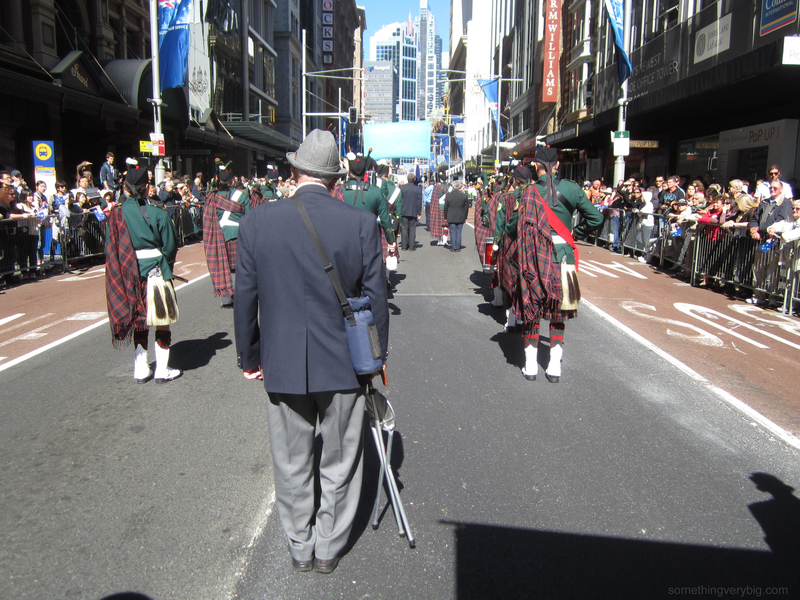 The noise made by the crowds that lined George St during last year’s march during the Centenary of Anzac was, genuinely, quite exhilarating. But at the same time I’ve felt a little uneasy. 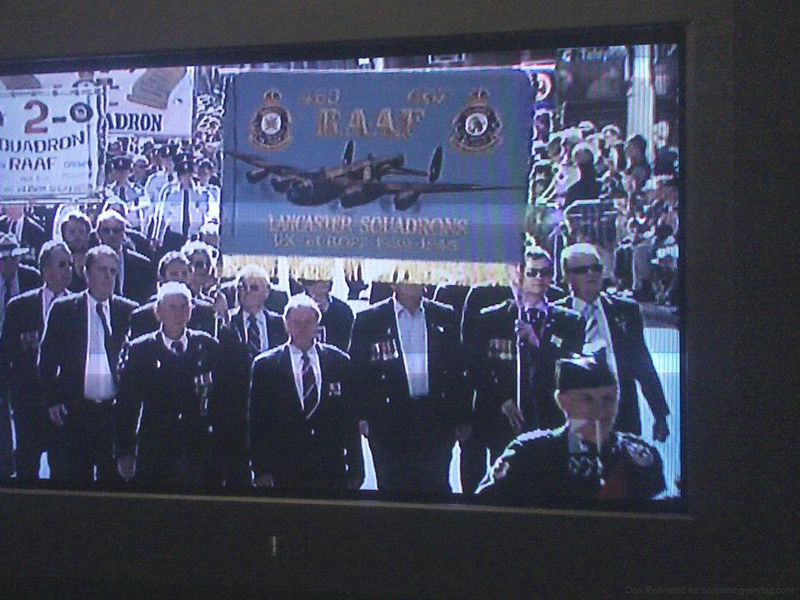 The applause and the cheering from the crowd is for those original veterans we have marching with us. Once they can no longer march, then what? The answer, I think, is that once we no longer have any originals capable or willing to march, the time has come to bring down the curtain. 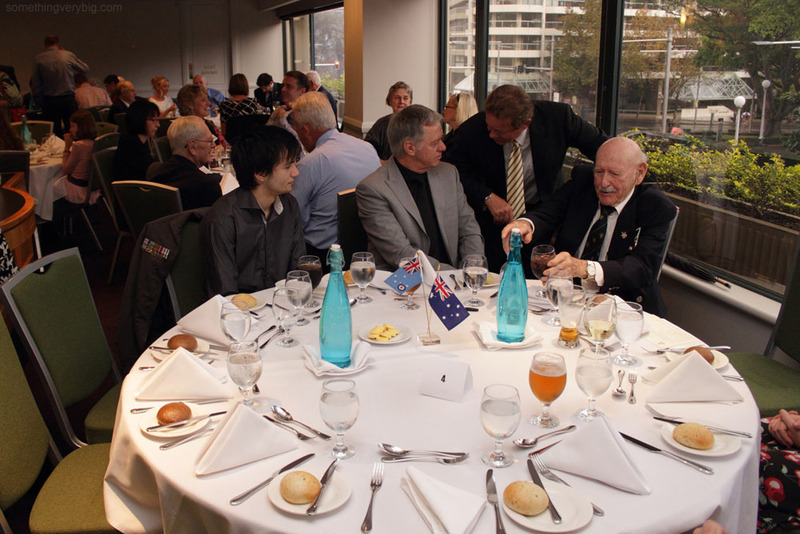 The fellowship evident at the 463-467 Squadrons Association luncheon each year – and indeed the increasing numbers seen at that and other functions in the last few years – shows that there remains a place for events of that type. 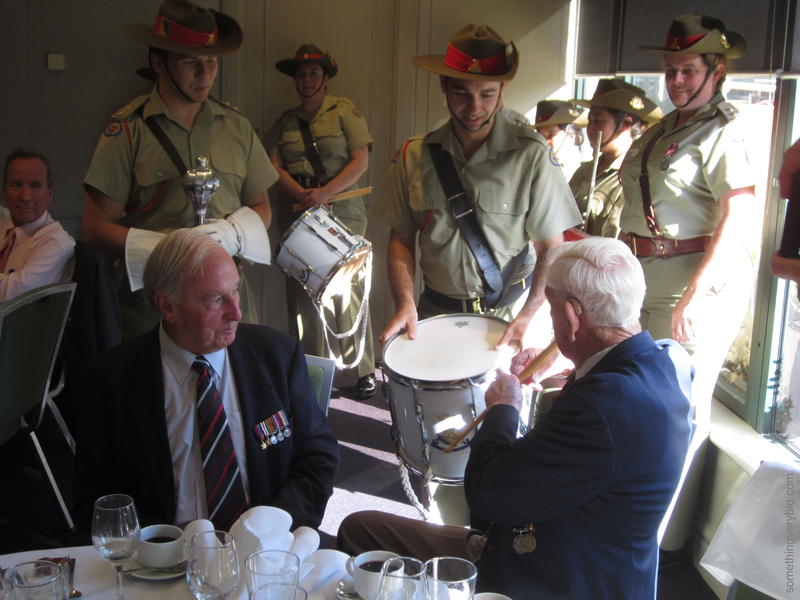 And of course other Anzac Day traditions such as the Dawn Service must also continue. But the March should be for the veterans themselves. While we still have veterans marching with us, I’m very happy to carry the banner for them. 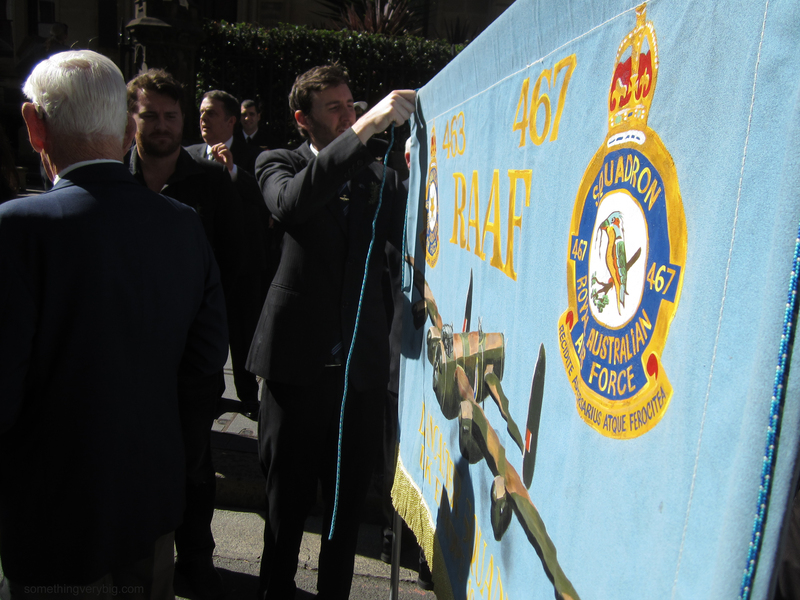 But on the day the last 463-467 Squadron veteran in Sydney dies, it’s time to retire the banner. It started at a different spot than over the previous seven decades. At a much earlier time. And the trains weren’t running (or so we thought). And there were (of course) road closures in the CBD. 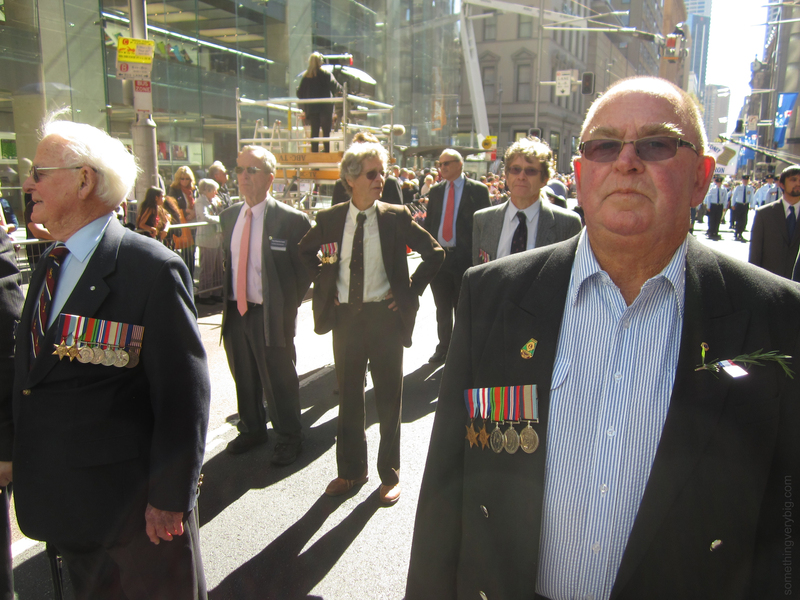 But we eventually made it to the start of the 2014 ANZAC Day march in Sydney last Friday. (And it was still raining). 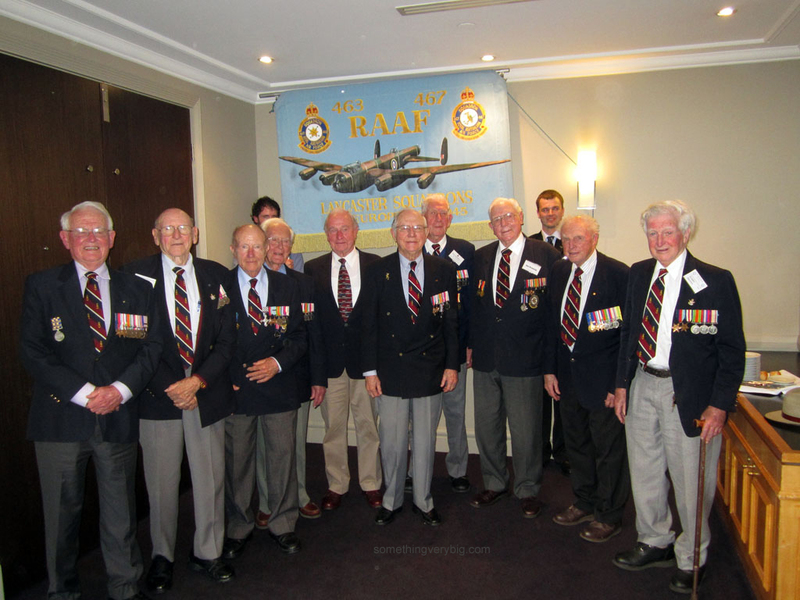 We found, in a large group of veterans and other hangers-on sheltering under one of Sydney’s tall office buildings, four familiar faces in front of the 463-467 Squadrons Association banner. Clearly we’d found the right place. 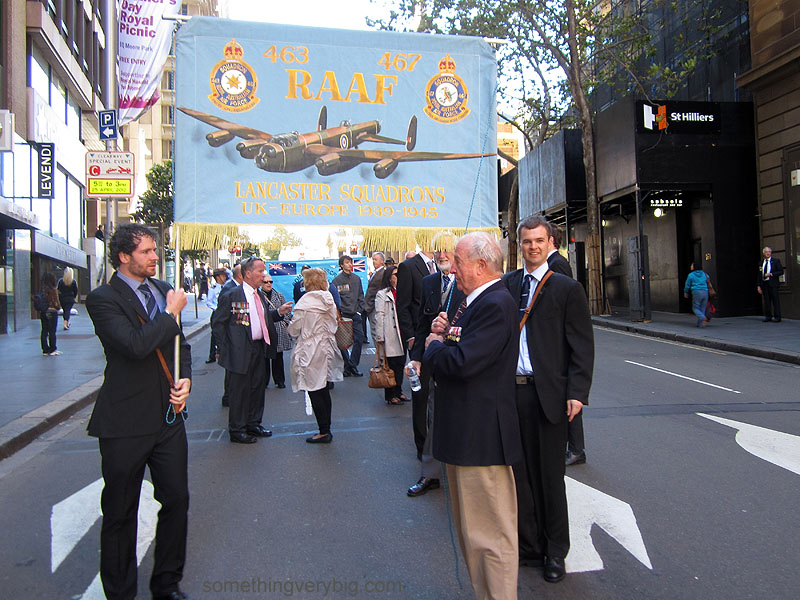 The rain abated for a moment and, with a little bit of encouragement from the RSL marshals, the various banners of numerous Air Force associations formed up on Pitt Street. 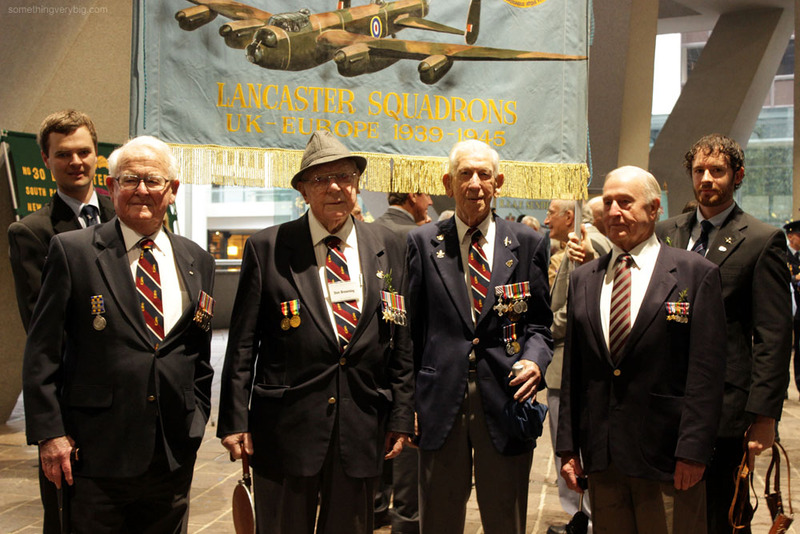 Bryan Cook (the young bloke on the right of the photo above) and I (on the left side of the banner) shuffled the banner sideways through the crowds, passing an Army LandRover in the back of which we found two more veterans we knew, wireless operator Harry Brown (106 and 467 Squadrons) and bomb aimer Keith Campbell (466 Squadron). We were marshalled into position as the rain started and the umbrellas came out once more. 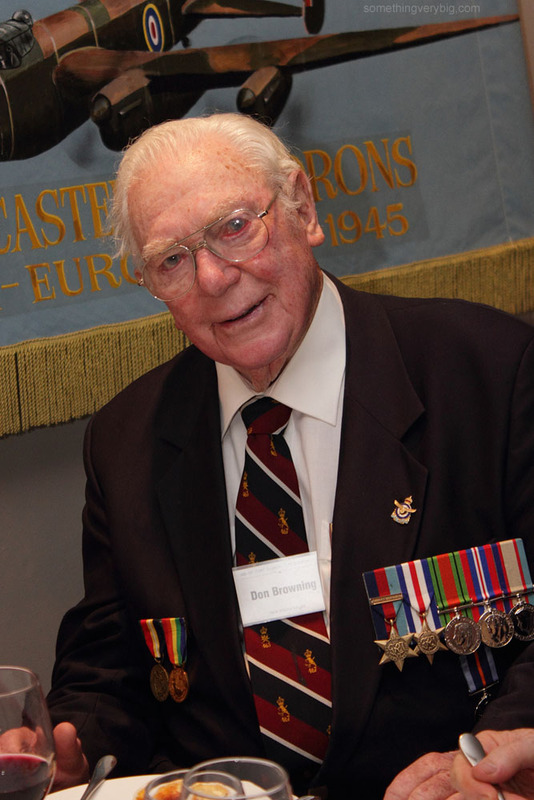 Don Southwell took the LandRover option, leaving us with three veterans for the march, with three people representing various other squadron members acting as carers. It was still raining. As the rain dried up the march proceeded. Unfortunately we were in the middle between two different bands, each playing a different beat, and so marching in step was a challenge. 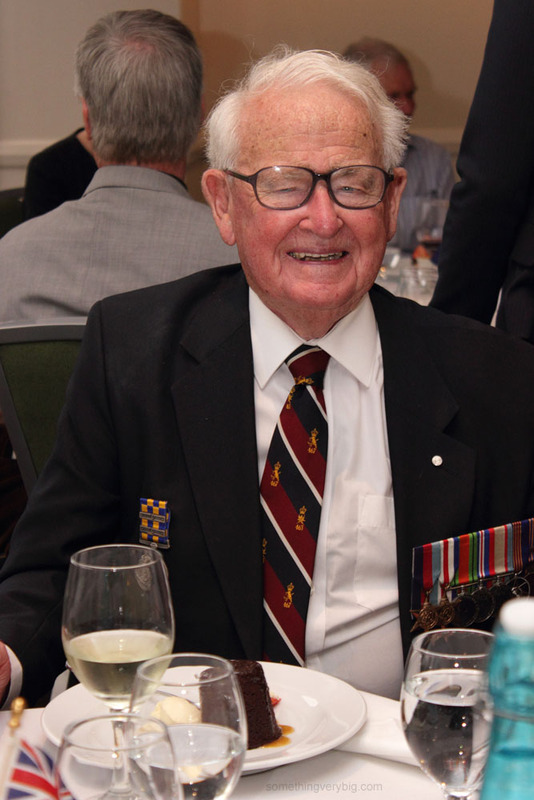 We made it past the Cenotaph at Martin Place and half way down George St when one of our veterans – Don Browning -started wobbling a little and made the decision to retire. A carer detached from the column to assist. No great harm done however, and in the end Don made it to lunch before the rest of us, having procured a lift from somewhere. Having completed the march, we carried the banner to the Pullman Hotel, across the road from Hyde Park, for what turned into a great lunch. 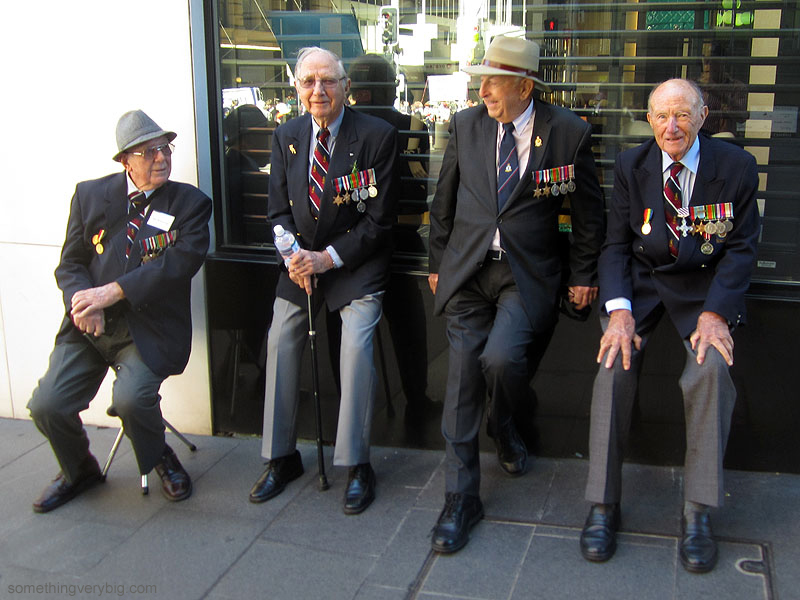 In all fifty people attended, and as well as the six veterans who participated in the march we were joined by four more: David Skinner, Alan Buxton, Albert Wallace and George Douglass. Outside, the rain continued to pour down. 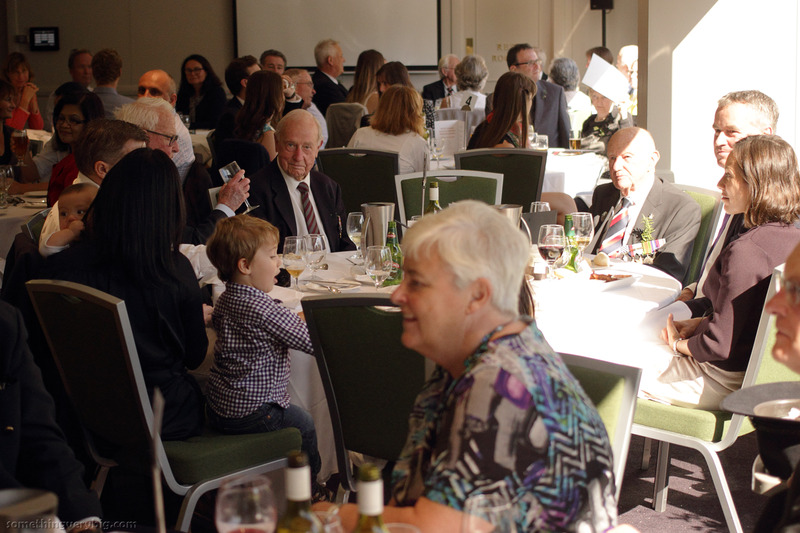 But as the desserts were being served, the day cleared up into one of those magnificent, mostly blue-sky autumn days for which Sydney is so well-known. 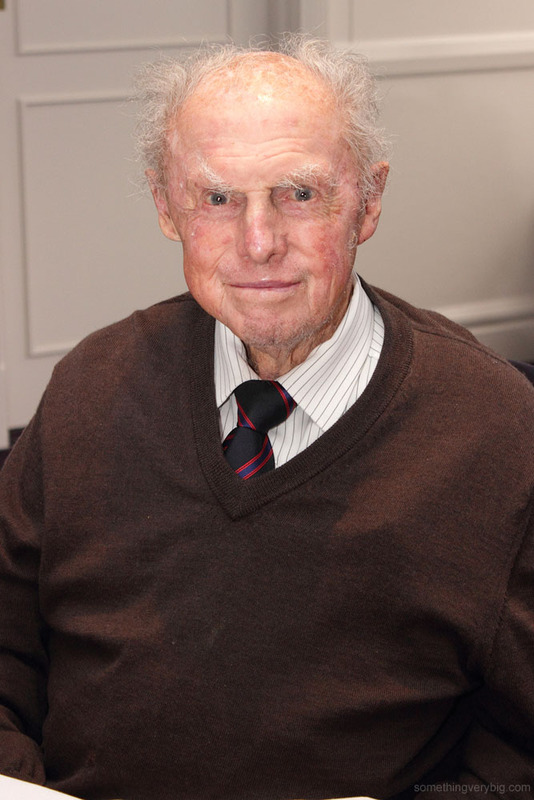 The most disappointing thing about the timing of that was that 463 Squadron stalwart Bill Purdy was unable to lead the planned Tiger Moth flypast, open cockpits and rain not being particularly good bedfellows. 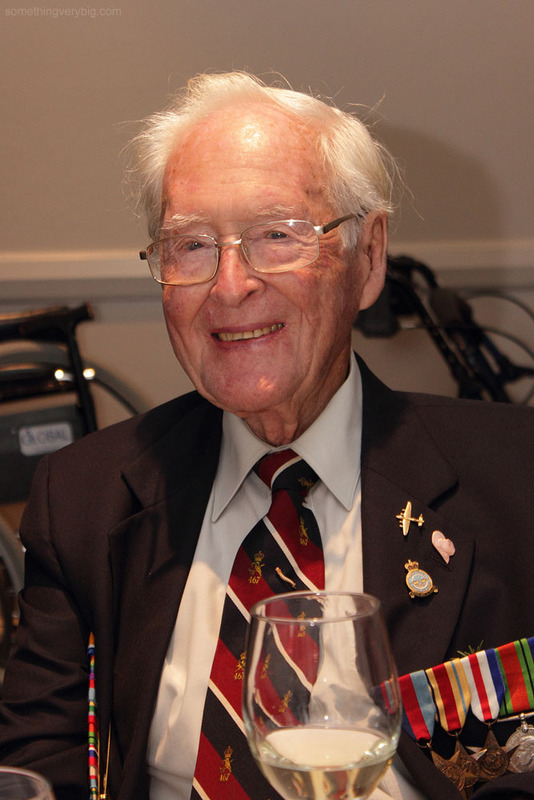 Age is now, undeniably, wearying the veterans of Bomber Command. 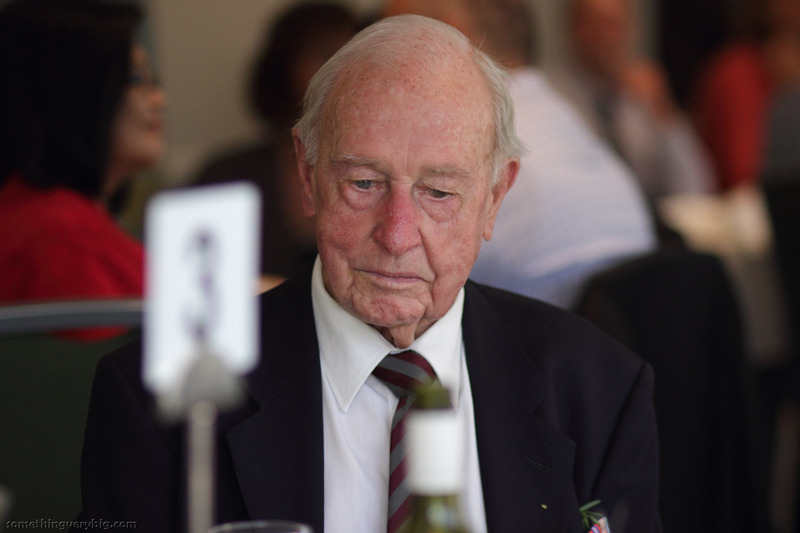 This was clear in the lower numbers of veterans taking part in the march, and indeed this is the key motivation behind the RSL’s move to change the format of the march in Sydney. 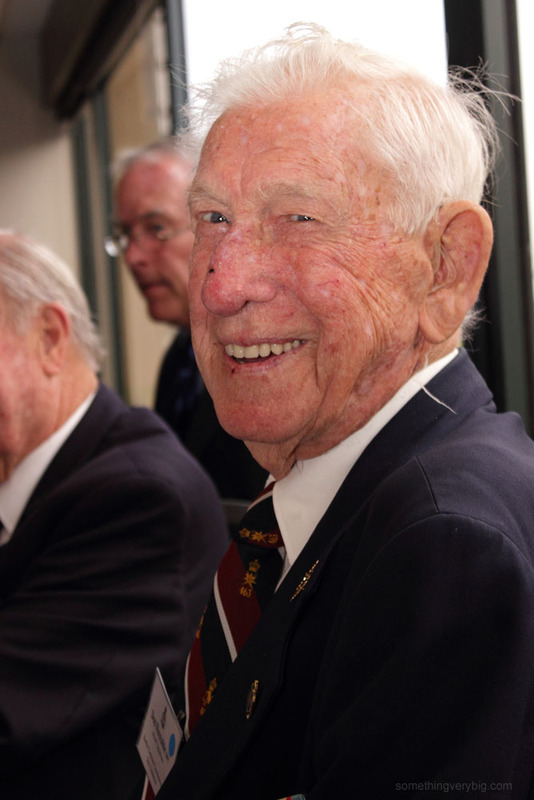 Very few veterans are now under 90. It won’t be too much longer before, like the veterans of the Great War before them, there are no longer any originals left to march. 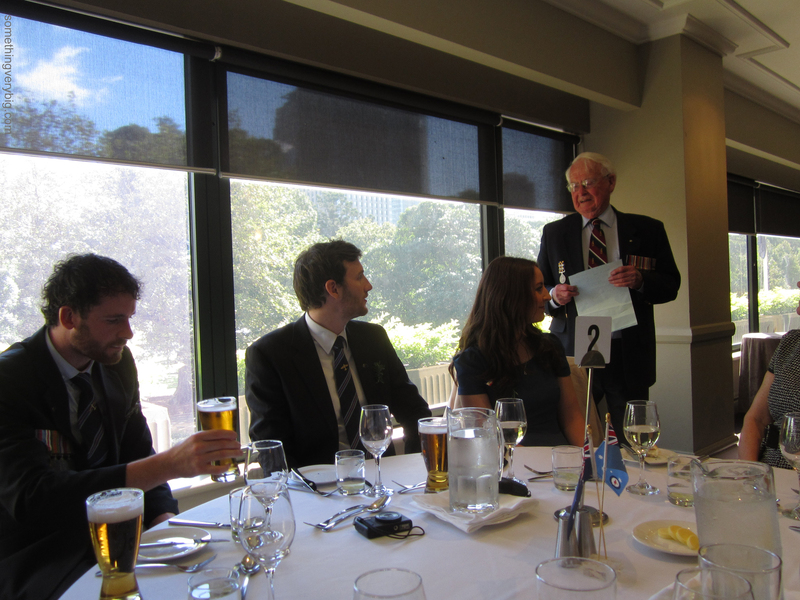 But the number of people present at the lunch last Friday is encouraging. 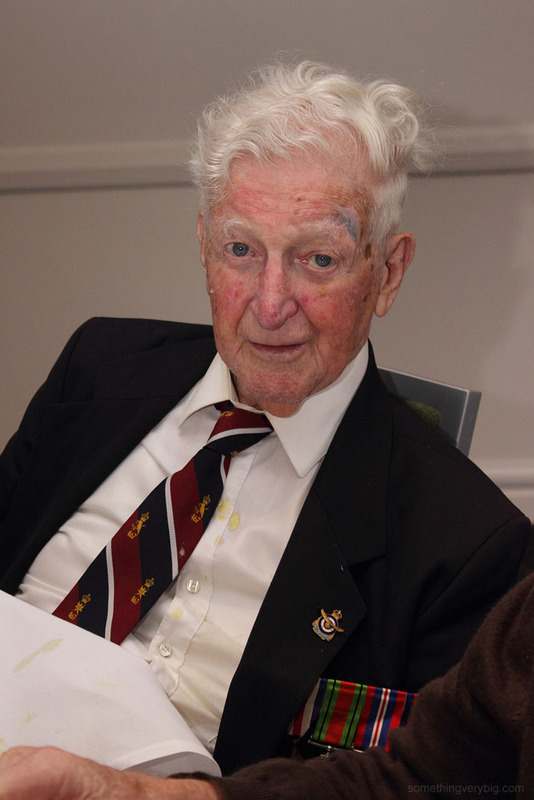 The interest from family and friends remains high and, while that continues, so too will the memories of these two Squadrons. 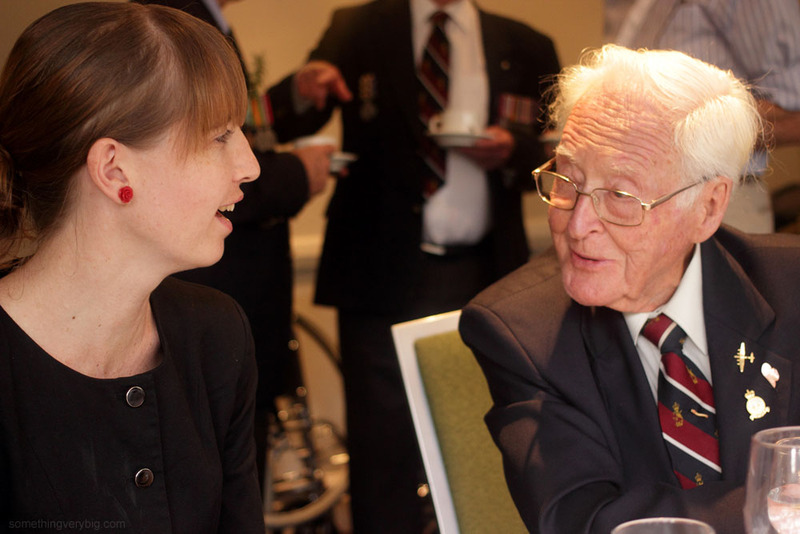 And while we still have Bomber Command aircrew with us, occasions like these offer the chance to talk to and celebrate some of the most remarkable people I’ve ever met. 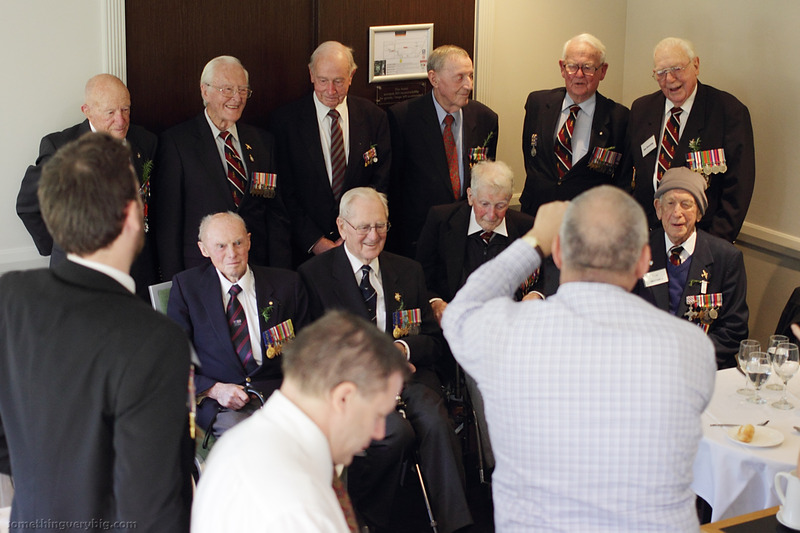 Photographic portraits of all ten veterans who attended the lunch are on a separate post, here. Text and photos (c) 2014 Adam Purcell.